I really like how unique the Space Wolves' thunder hammers are, but I wanted something even more unique. 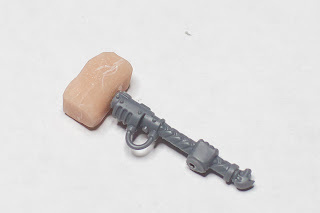 I thought it would be really cool for the leader of my thunderwolf cavalry to have a thunderhammer that he crafted himself out of a huge stone. I made it out of Super Skulpy by first forming a block like shape out of the skulpey that was a bit larger than I wanted the finished product to be. After it was baked, I used my knife to carve it down to the shape I wanted. I carved it to be a bit uneven, and rough around the edges so it would look like carved stone that has seen many decades of bashing. As you can see, I drilled a bit too far through the hand for pinning so I will have to touch that up with greenstuff. 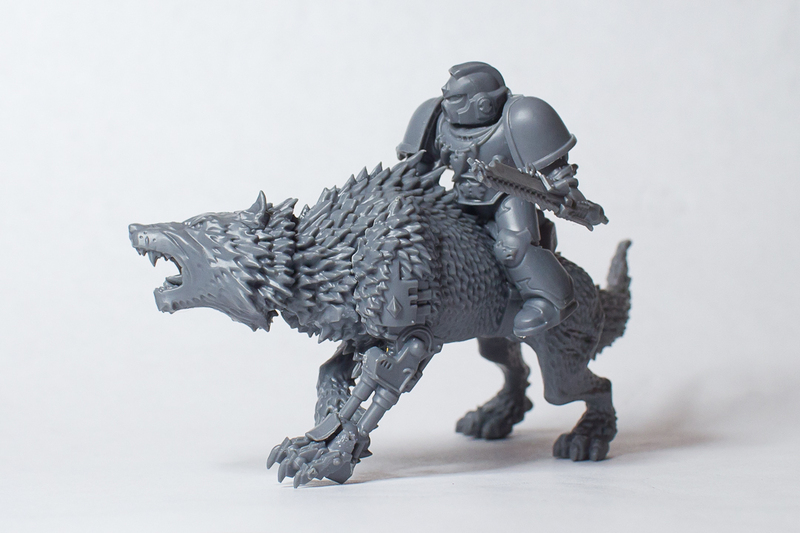 Here is a mostly assembled thunderwolf. 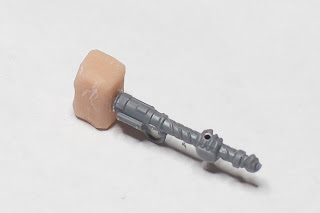 I don't have the thunderhammer guy assembled because I'm going to try adding some extra decorations and other things to him. I'm also going to have to think up some awesome bases for these guys. Some sort of mountanous, snowy terrain with ancient runes carved in the rock. And here are a few of the newest additions to my Angels of Retribution! These are the Sanguinary Priests/Apothecary/P***** (Deleted from Imperial Records). 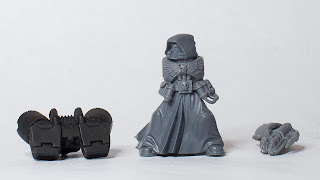 I made these guys from bits from the Dark Angels upgrade sprue which I bought with the GW gift card graciously given to me by HOTpanda over at The Chaos Manifesto. 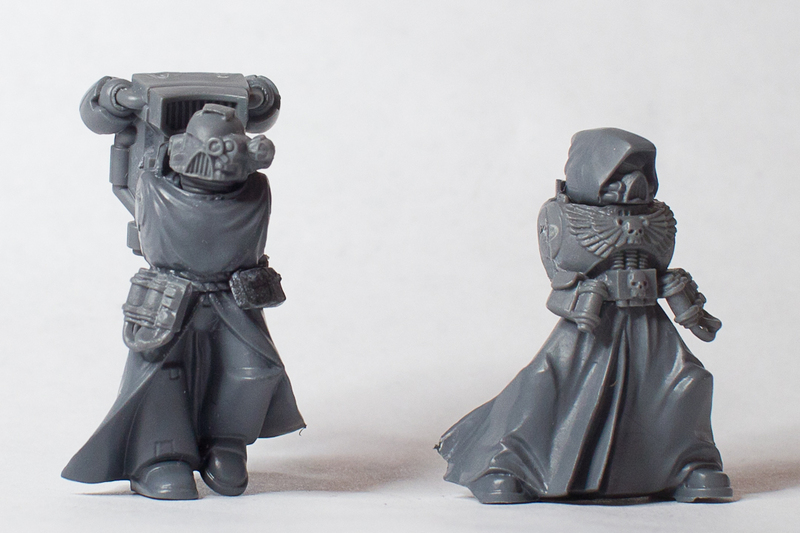 I've always loved the robes and hoods on marines so I'm glad I finally get to try them out. 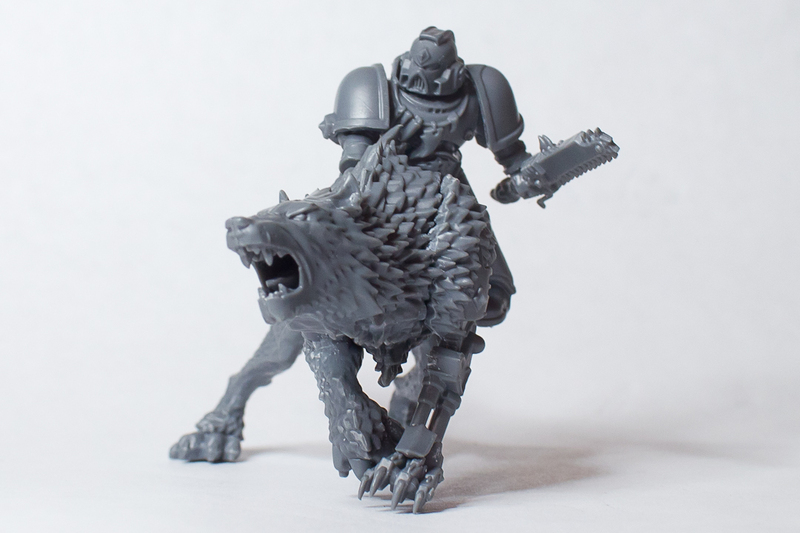 And all of the other bits are going to make for many fun conversions! Thanks HOTpanda! 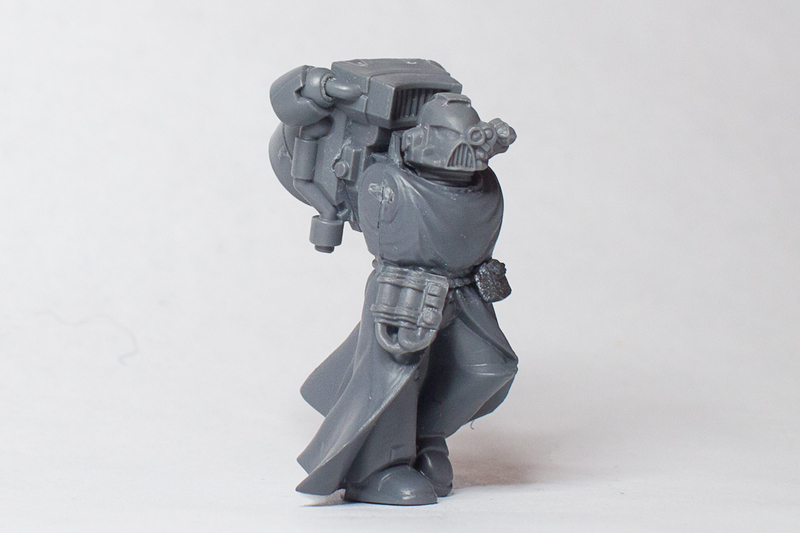 Here's another (very) WIP shot of this apothecary. I still haven't decided what I'm going to do with his right arm. (I'm thinking bolt pistol for one guy, and maybe a chainsword or axe on another). Also, I can't really glue any more together until I get to painting since the arm and jump pack cover up too much detail that I wouldn't be able to get to like the vials on his belt. And here's one more photo of a slightly different angle of the other guy. I like the two different styles of jump pack. It gives them each a bit of individuality. Also this guy doesn't have a hood since the intake to the jump pack is right behind the head. Well, that is it for now. I have quite a bit more that I've done over the past few months that I haven't posted so I'll try to do some more updates. Thanks for reading, and thanks again HOTpanda! Word up bro I just bought two of the upgrade sprues myself. I am using them to convert up an army of Fallen Darken Angels that are now followers of Nurgle. Thanks for the shout out and as alsways keep it real. That guy does some amazing work. I wonder If I would be able to pull off that knotwork design?